This 4 bedroom, 1.5 bath cottage is truly a vintage Victorian. It's like stepping back in time when you enter this cottage. The country kitchen has all the amenities yet keeps the rustic character of days gone by. The living/dining combo is spacious and inviting with a propane stove to cozy up to. There are 4 large bedrooms (3 double beds, 2 single beds) all with ceiling fans. There is also a whole house fan and 1 window AC unit. The full bath features a claw foot tub and there is a separate shower room. There is also a half bath on the main floor. The porch is wrapped around 2 sides of the cottage with numerous seating areas and a porch swing. There is off street parking for 2-3 cars. The location is close to all the Mt Gretna attractions yet offers the quiet atmosphere of peaceful Campmeeting. This cottage will accommodate the entire family comfortably. 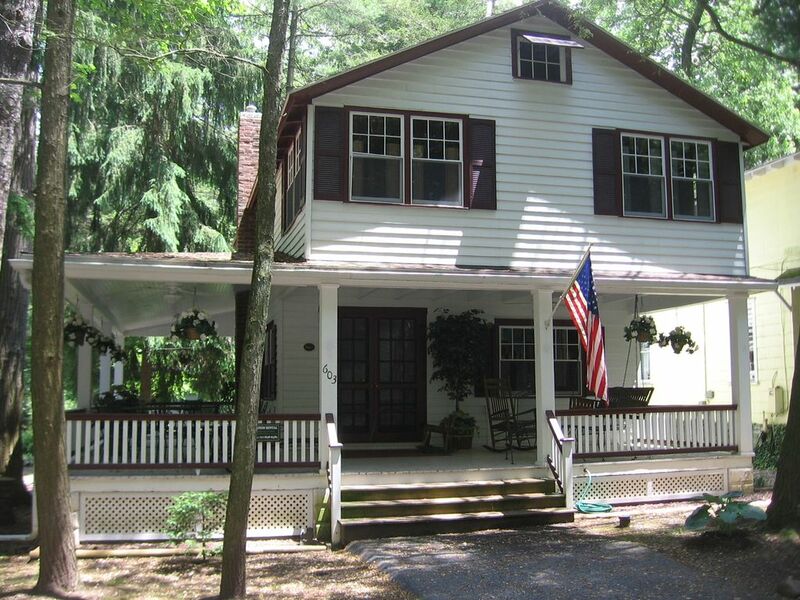 Enjoy the Mt Gretna summer on the spacious porch. Every thing about this place was great, I am a artist specializing in papermache Santas with a primitive look, and this place was so fitting for me, loved the article in Early American Life about the owners, absolutely loved the primitives, we enjoyed the lovely porch and lucked out as the Mt Gretna yard sales were going on! It was close to the wedding venue which made it so convenient for a bridesmaid. Forgot to sign the guest book, we will be back to stay again.